Amtrak’s iconic departures board is heading to the Railroad Museum of PA as soon as January. Nov. 29, 2018, 9:15 a.m.
More than two years after news broke that Amtrak would replace the iconic departures board at 30th Street Station, the move looks like it’s finally about to happen. The Pennsylvania Historical and Museum Commission expects to take ownership of the world-famous Solari board as soon as January 2019. The model, which flips individual panels each time a train’s status is updated, providing that classic “clicking” sound familiar to travelers around the globe, is considered an antique. An official agreement hasn’t yet been signed, so the transfer date is subject to change. But Howard Pollman, spokesperson for the historical commission, is pretty certain he’ll receive the board in late January or early February. At that point, the sign will move 60 miles to its new home: The Railroad Museum of Pennsylvania in Strasburg. And it’s not a moment too soon, per museum site manager Patrick Morrison. They’ve been negotiating an agreement with Amtrak for more than two years. Morrison is thrilled to acquire what he calls an “electromechanical wonder” and incorporate it into an existing exhibit. Amtrak officials confirmed the expected January move date to the Inquirer and Daily News on Thursday. The installation of digital signage will begin in December, per that report, with displays installed above the stairways that lead to platforms. Despite their storied history, commuter organizations often advocate to replace the Solari boards. Oftentimes, they’re so old that they start to break, making commuting more difficult. And the technology is dated. Philly operates its Solari board using Windows 95. “Anything you can do to improve the traffic flow of humans through the space is going to be a plus,” Jim Mathews, the president of the National Association of Railroad Passengers, told the New York Times. Still, regulars will miss the board — the old-timey clicking sound elicits a wave of nostalgia for commuters and long-distance travelers alike. 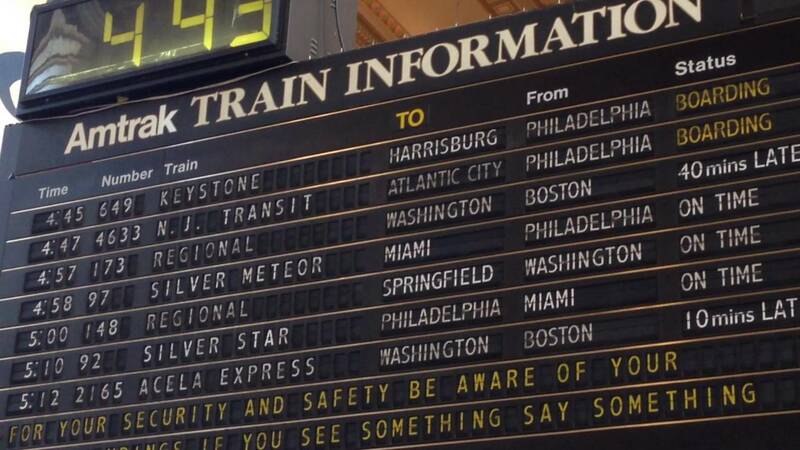 Lucky for those nostalgic passengers, the Philly Solari board isn’t gone forever. Railroad Museum officials expect to incorporate it into a public exhibit in 2019. So where’s the Solari board actually headed? To an exhibit called “All Aboard!” that has been in the works at the Railroad Museum for a year. The board — which Morrison called one of the museum’s more modern artifacts — will be positioned on a mock-train platform in a subsection of the exhibit. Visitors can travel through other sections, too, like one on rail dining and another on train advertisements. Disclaimer: Inside the exhibit, the Solari board might not actually be turned on. If running the board turns out to be too difficult, Morrison said they’ll probably run a video of it in the same room as the board itself. That way, visitors still get the clicking sound. “We want to give folks a feel of what it was like when it was run,” he said. Though on display, the Solari board will catch way fewer eyes in the Railroad Museum than it does in its current home. 30th Street Station is Amtrak’s third-busiest stop, serving 16 million people annually. The Railroad Museum gets about 115,000 visitors every year, Morrison estimated. The hardest part? Moving the damn thing. Morrison estimates the board weighs a ton… literally. They’ll have to find a way to get it out of the busy 30th Street Station, likely using a crane during non-peak hours. Then it’ll have to enter the museum through roll-up doors — the same huge ones that they use to get actual trains inside. It will probably cost the Railroad Museum tens of thousands of dollars just to move it. But for the sake of preserving transit history, Morrison is confident that the effort is worth it.